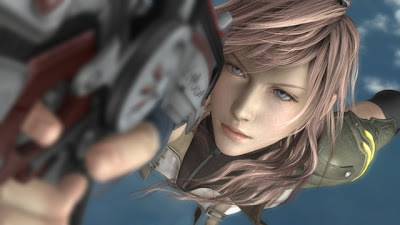 Planet Hell: Final Fantasy XIII preview. So this will be coming out pretty soon now, almost a month and I've been keeping an eye on people's impressions of the Japanese release. I've got a bad feeling it is going to be quite dissapointing, and I've been looking forward to playing it for so long, even attempting to beat my unfinished FF games so I can start this one up immediately. Sounds like heresy? Allow me to present my case. 1) It seems they are shitting over half the FF staples and mythology, like Shiva for example. OK, motorcycle-transforming twins with wheels on their heads? Who the hell thought of that? I guess some people will be thinking it is good that they are changing stuff and trying new ideas, but there is a limit to the madness, or there should be. 2) Hectic looking combat. For me, I am more a fan of battle styles that I have a bit of time to think about what I am going to do. I mean, I'm not completely against action RPGs, in fact I really like some. I'll probably have to actually play it to see what I think. XII's battle system alienated people and fans of the series who preferred the turn based combat of the earlier games. I reckon if the battle system isn't top notch, people might dislike it. 3) Linearity. Urgh...I am not a big fan of linear RPGs. I like a bit of exploration, and by the sounds of it, this is just as much as, perhaps even more linear than Final Fantasy X.
I reckon this game could have a big mainstream audience now, and perhaps a linear run of the story might help newcomers to the series or genre stick with it. 4) Healing after every battle, like Dragon Age: Origins did, you get healed fully after every battle. They did this so that the game can keep flowing, you don't get bogged down in dungeons or have to hold back on using your abilities. This can work, if the challenge of the actual battles is well balanced enough, but it could be seen as a flaw, perhaps making it too easy. We shall see. Mages and Healing classes are some of my favourite, so will this be a good thing or a bad thing? Conversely, the author did a post on the things they did like about the game. So perhaps there is hope. My thoughts, I'm going to make up my own mind when I play it. And OPM, remind me never to buy that magazine. I've preordered my copy for the PS3, so I'm looking forward to playing it in March. I'll need to actually get a PS3 for it...March is gonna be expensive. Now Playing - "Now your job is finish." Now Playing - "Mother Ocker"
Anime Impressions - Makai Senki Disgaea. Now Playing - "Ridess zee Shoopuf?"